Low-cost, reliable, maintenance-free. Operates at 10 readings a second measuring a 2.8-inch diameter spot on the line. Instrument is accurate and self-calibrating. Microscope Spectrophotometer CM-300, Ultra-Small 0.2mm to 2.2 mm View Area. Has five different color space systems including Munsell and a spectral curve. Includes a NIST traceable calibration tile and a one year warranty. 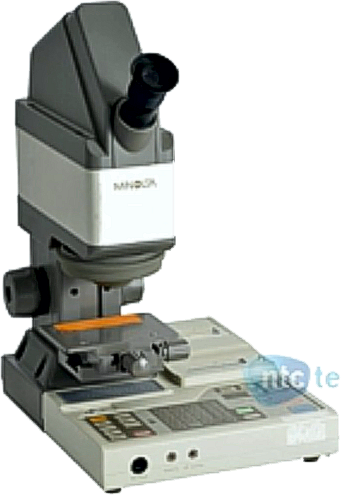 Microscope Colorimeter CR-241, Ultra-Small 0.3mm -1.8mm View Area. Has five different color space systems including Munsell. Instruments are remanufactured with a NIST traceable calibration tile and a one year warranty. WIRING HARNESSES - Color codes on wires. MEDICAL - Analysis skin cancer, biopsies. MUSEUMS - Paint chips, Artifacts, Textiles. AGRICULTURE - Individual grains, seeds, rice, nuts, infestations, leaf diseases, mold. PHARMA - Small pill color, Color dot of pregnancy kits. PRINT - Bank Notes, credit card fonts, print letters, laser print, pixels.